Care will be given to toddlers when they carelessly break the bowls. However, senior citizens will be blamed if the same circumstance falls on them. The young will definitely be raised but the old do not seem to enjoy this privilege. That's cruel for the disabled and the demented. It can be said that the old degenerate as the young grow. The old are neither demented nor useless, they just return back to their childhood. Please be patient and kind to them if they forget their past, like how to eat and speak. Though suffering from the loss of memory and self-care ability, they still need to be loved and live well in their later life. Do You Know What is Dementia? With the coming of the aging population, dementia has become the focus of public healthcare worldwide. The danger of dementia is not under well control and is a lack of sufficient remedy. The number of demented people is increasing compared with its first rank in the world. Of roughly 10 million old people have suffered from dementia. However, the demented people in China and their family are helpless because of illness stigma and discrimination as well as lacking social care and support. In fact, the elderly demented people can still enjoy their lives if considerately professional care and better instruments are provided. The activity of caring for the elderly disabled and the demented people——delivery of senior citizens' bags was held by the Nursing Center of China's Foundation for Poverty Alleviation(CFPA) in Ya'an, Sichuan Province, and the center arranged the volunteers of the 'Time Bank' to deliver senior citizen's bags. That was how they can know the need of the elderly demented people, especially the impoverished and the vulnerable and help them to establish a professional lifestyle which is available for the old. Meanwhile, based on the Nursing Center of CFPA, the volunteers can provide professional expertise for the elderly demented people. With the help of the volunteers from the 'Time Bank', the Nursing Center of CFPA provided senior citizens' bags for the elderly demented, impoverished and vulnerable people for free, thus helping the old to keep healthy and lead a convenient life. Since the initiate of the nursing center project of CFPA in 2015, CFPA has provided professional and excellent nursing service for the elderly demented people, particularly the impoverished old people. 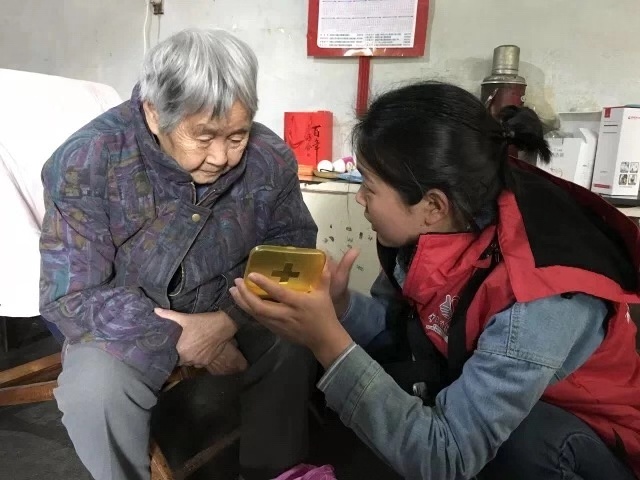 Taking Ya'an, Sichuan Province as the place of this piloted project, CFPA tries its best to forge the philanthropic nursing program in Ya'an. In 2017, the nursing project forged the first philanthropic nursing program in China, the Nursing Center of CFPA in Ya'an. By now, the project has established a 5760㎡ center consisting of 156 beds, which is suitable for the old. And the center is opening for the elderly disabled and demented people across China.